When you add it all up, there is a lot of trash all across the country. Lucky for us there’s a group of hardworking volunteers who are determined to make a clean sweep of things. Pick Up America is the organization and they just had a stop in Stockton. Pick Up America isn’t just about picking up the trash. They hope that the work they do will inspire local communities to organize similar projects. Based on the enthusiastic response they receive here in Stockton we could well be on our way to a much cleaner city. Now the rest is up to you. Too often neighbors get into squabbles over things like unkempt yards. For the homeowner who has a clean front yard they’ve put in the effort and feel like everyone else in the neighborhood should get on the bandwagon. However, just because someone has some junk in their yard doesn’t mean they don’t take pride in their home. It could be they don’t have any way of getting rid of that junk. At least that was the excuse before Junk King Stockton came into town. Now, everyone can clean up their yards of all kinds of trash in a very short amount of time. When you hire Junk King you’re actually hiring a two-man crew. They will be the ones who will be doing all the actual work. If you’ve got things like tires, car parts, appliances or piles of dirt in your yard all you have to do is tell the Junk King crew to take it away and they’ll get the job done. Don’t worry about getting their truck dirty. To them a dirty truck means a happy customer. Beyond what you neighbors can see in your yard is all the stuff you’re keeping in storage on the inside of your house. Here is where you can really benefit from Junk King. That’s because they’ll be able to give you back your spare room or garage. As soon as you tell them to clear out the clutter, you can do whatever you want with that space. Need a home office? Want a spare room for the kids? That can happen within minutes of Junk King driving off with your stuff. As part of their policy, Junk King Stockton strives to make sure whatever they take away will get recycled. You don’t even have to ask because they’re going to do it anyway. Junk King will also work on your schedule. 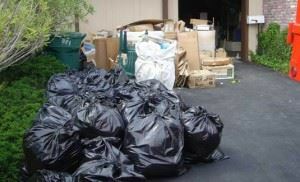 You’re simply going to be amazed at how easy it is to get rid of all your junk. This entry was posted in Junk King Stockton, Stockton Junk Removal, trash outs and tagged Pick Up America, Stockton Trash Outs on June 27, 2013 by Carlos Duenas. Last updated August 2, 2017 .